This page uses affiliate links. Feel like you are constantly on social media? Trying to manage your Pinterest account but find your time being sucked away? 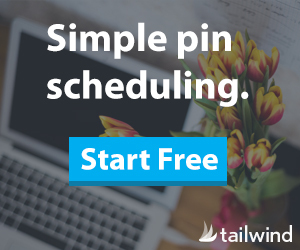 Enjoy the security of scheduling with a Pinterest verified partner. Automatically schedule content to optimal times with one click. Receive suggestions for how you can improve your account. Schedule repins from the Pinterest feed. See your Pinterest analytics in your dashboard with added insights. Grant access to your social media team. Analyze content trends to understand what your audience wants. Schedule at anytime with the convenient Tailwind iOS app. *This offer entitles redeemer to a $15 account credit when they sign up for, and pay the first month of Tailwind service. The value of the account credit will not be more than the cost of the first month of Tailwind service purchased. Limit 1 offer redemption per person, company, organization, pinterest account or email address. Not redeemable for cash value. Tired of the hamster wheel? There is a SMARTer way to write and promote your blog content.